I've just realised that actually nothing's outside my window at all (except for some wood) as everything is actually inside it! I used the little porthole stamp from Waltzingmouse's Half Pint Heroes, together with the Woodgrain stamp. I put it behind the negative circle die cut and I've also covered it with acetate to make it look more 'window-like.' One of those cards that looks a lot better in real life - it's a terrible photo as it's so late here so I may try and take a better one tomorrow. Speaking of late...I'm off to bed! So cute! Love the card. Thanks for sharing at Less is More! I do this all the time with challenges...or create and then never post!! I LOVE your card. The wood texture is so fun with the little person peeking outside the peep hole. ADORABLE!! Such a fun and creative card! Great entry! I think this is great. Very clever for our challenge. lol your post made me laugh how often have I misread a challenge, but at least there is wood outside your window. 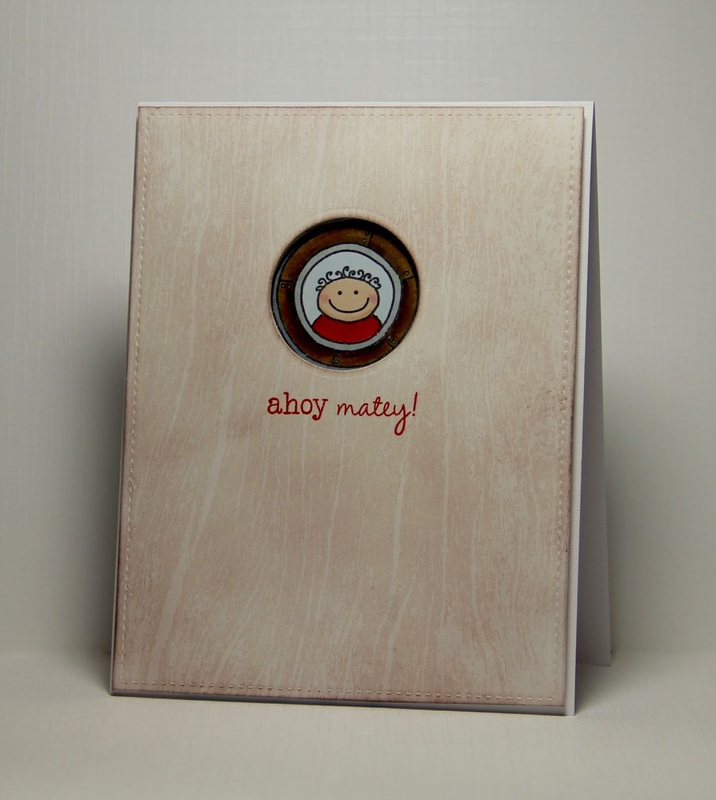 This is such a super fun card love that little guy and your photo is fantastic ! It's taken me a while to get around to seeing what's outside your window! This dear little face really made me smile... what a fab card!